← How to Turn off Facebook’s New Facial Recognition Feature? I have been using a combination of a backup WordPress plugin and a cron job to backup my site files over ftp. The WordPress plugin would backup the MySQL database and email it. Then I’d have to FTP out backups of PHP files created by a cron job. Then if I have to restore my WordPress site for any reason, I’d have to put these both together and hope it works. That’s when I came across a solution called XCloner which is available as a WordPress plugin as well. How to Setup Backups with XCloner? On plugin installation, your initial credentials to login in XCloner (under Plugins tab) Settings page is admin/admin. 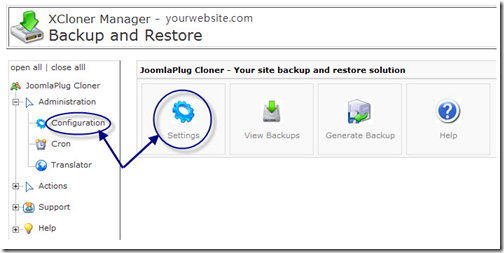 XCloner is a great way to get complete site backups for any PHP/MySQL based web applications including Joomla. It can backup locally or email it or even ftp it to a remote location. You can create partial or full backups and even run multiple cronjobs. Another useful and important feature is the ability to restore your backups to a totally different server with new server and MySQL details. If you have looked at paid solutions like VaultPress or paid plugins like Backup Buddy, XCloner is a great free alternative. You can also purchase support from them. I am definiteely adding XCloner to my top WordPress plugins list.